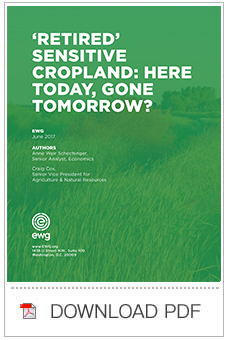 Home > Research > ‘Retired’ Sensitive Cropland: Here Today, Gone Tomorrow? The environmental, public health and natural resources problems plaguing American agriculture are daunting and getting worse. Shifting environmentally sensitive land out of row crop production is one the simplest and best ways to mitigate these problems. But unless management and land use changes endure over the long term, the environmental and other gains will prove fleeting. The Conservation Reserve Program, or CRP, is a federal program that pays farmers to take their land out of production. But since CRP contracts only last for 10 years, many CRP acres are plowed up and returned to cropland when contacts expire. This means not only the loss of conservation benefits, but also squandered taxpayer money. Between 2007 and 2014, 15.8 million acres in the program were not re-enrolled when contracts expired – these acres cost taxpayers $7.3 billion over the terms of the contracts. Now that crop prices have fallen, landowners are once again interested in putting acreage back into CRP. But because of the fleeting environmental and public health gains of this program, funding in the 2018 Farm Bill that could go toward expanding CRP should go toward permanent or long-term easement programs instead. Two proven programs are already in place: the Conservation Reserve Enhancement Program, or CREP, which works with states to target high-priority conservation objectives, and Wetland Reserve Easements, part of the Agricultural Conservation Easement Program, which seek to enroll wetland acres in long-term or permanent easements. These programs should be higher priorities in the 2018 Farm Bill than increasing the acreage cap of short-term CRP rental contracts because they provide long-lasting environmental and public health benefits. That’s a better investment for taxpayers and the environment.